HFCWO is defined by extra-thoracic oscillations generated by forces external to the respiratory system (Warwick 1991). External chest wall oscillations are applied using an inflatable vest around the torso which is either battery operated (Fig. 1) or is attached to a machine (Fig. 2) which vibrates at variable frequencies and intensities, as set by the operator, to ensure the individual’s comfort and associated concordance. 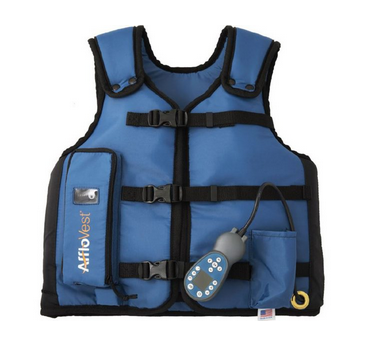 This type of device is also called the Vest because the interface between machine and patient is a custom made vest through which the oscillations travel. The “Vest” is not commonly used in Australia. This relates partly to the cost, and the weight (around 8 kg). There is some evidence based literature on the Vest and it is worth considering in individual circumstances related to lung pathology and those with co-morbidities. HFCWO uses positive and negative pressure changes to augment peripheral and tracheal mucus movement towards the airway opening (Gross & King, 1984). Air pulses are transmitted to the vest at a high frequency increasing oscillatory chest wall compressions. During inflation the pressure increases to between 5 and 20 cm H2O causing a short burst of expiratory flow of up to 1.6L/second. The device usually operates between 2 and 25Hz. It is thought that secretion mobilization is enhanced by the use HFCWO by increasing the air-liquid sheer forces during expiration. Another theory is that displacement of the airway walls may disengage secretions and enhance the effect of air-liquid flow. HFCWO is also thought to enhance ciliary beating and change the tenacity of bronchial secretions, making them less thick and therefore easier to expectorate (Hansen & Warwick, 1990). To purchase The Vest or Afflovest. HFCWO allows the patient to receive treatment to a large portion of their lung in a variety of modified postural drainage positions. It can be also done in sitting, thereby eliminating issues associated with reflux and certain modified positions. HFCWO can be administered by a physiotherapist, appropriately trained carer, or the patient themselves, allowing the potential for independent treatment. Can combine HFCWO therapy with a mucolytic inhalation and intersperse every 5 minutes with periods of either PEP therapy and huffing and coughing to clear the mucus. A program can be set up whereby the frequency and pressure is adjusted approximately every 5 minutes or as indicated to assist with sputum movement from the peripheral to the more central airways. large pleural effusion or empyema. HFCWO has been found to be safe and have variable efficacy in children (over the age of 7yrs) and adults with mild to moderate cystic fibrosis in an exacerbation during the hospitalisation phase and at home during the maintenance phase ((Darbee, Kanga, & Ohtake, 2005), (Kempainen et al., 2010), (Oermann, Swank, & Sockrider, 2000), (Osman, Roughton, Hodson, & Pryor, 2010). Sputum clearance with HFCWO is reported to be similar to PEP therapy (Braggion et al 1995) however other authors report that it is less effective than ACBT (Pike et al 2004). 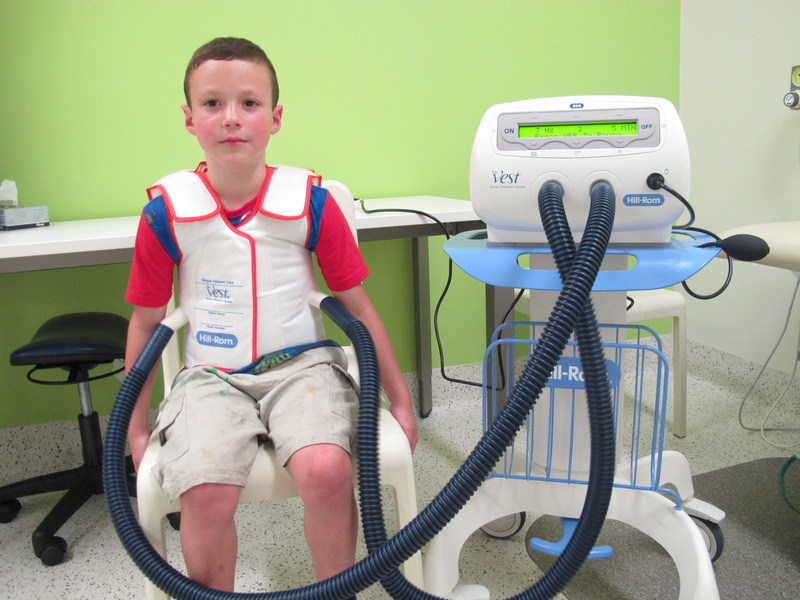 A more recent study long term study comparing PEP therapy and HFCWO found a significant difference in terms of number of pulmonary exacerbations and time to first pulmonary exacerbation, in favour of PEP mask therapy. The author concluded that the use of the HFCWO as a primary airway clearance in children with CF should not be supported (McIlwaine et al 2013). There is currently no evidence for the use of this device for children with non-CF bronchiectasis. Although HFCWO devices are not readily available in Australia, many other airway clearance options available that are cheaper and highly effective.